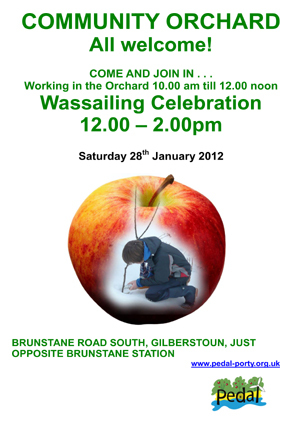 Come and join in a Wassailing Celebration at the Community Orchard on January 28th. There will be a nor­mal work day in the orch­ard from 10am to 12 noon, fol­lowed by the was­sail­ing cel­eb­ra­tion from 12 till 2pm. The Apple Wassail is tra­di­tion­ally per­formed in the winter to bless the trees with songs and offer­ings of cider. There will be an inform­al work­shop to learn some was­sail songs, includ­ing a newly writ­ten Edinburgh Wassail and a song spe­cif­ic to the trees in the Donkeyfield Orchard. This will take place on Monday 23 Janaury at 7 Rosefield Avenue, 7:30 – 9:00pm. Please let Jane know if you are plan­ning to come. This entry was posted in events, Food, Orchards and tagged apples, events, wassail. Bookmark the permalink.